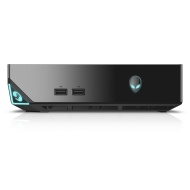 Сервисом alaTest было собрано и проанализировано 18 обзоров для Alienware Steam Machine (2015). Средняя оценка этого товара 3.2/5, в сравнении со средней оценкой 4.1/5 для других Настольные компьютеры. Комментарии о размере и удобстве использования в целом положительные, размер и удобство использования также получили хорошие мнения. Мы проанализировали оценки экспертов и пользователей, дату выпуска продукта и другие факторы. По сравнению с другими товарами из категории Настольные компьютеры, Alienware Steam Machine (2015) получил alaScore™ 91/100 = Отличное качество! The Alienware Steam Machine is a bold experiment in PC/console crossover gaming, but you may just want to stick with the larger game library on the Windows version of this hardware. The Alienware Steam Machine's wonderful dream of PC-gaming optimized for your television is undercut by the disappointing reality of a gaming PC that only supports Linux. Compact, attractive design. Includes Steam Controller. SteamOS brings PC-gaming innovations to the television. Performance surpasses consoles. No Windows support. Only compatible with the fraction of Linux games available on Steam. Pricey considering the specs. While its custom software is rough around the edges, the Alienware Alpha handily sets the standard for Steam Machines to come with style. What if you could buy a new type of gaming console that had the guts of a PC, a pre-established library of 1,000 games, a tried-and-true interface already beloved by hard-core gamers and an innovative new controller, and have it all cost less than $500? We will continue to test the Alienware Steam Machine, and will offer a full review once the system software and firmware is finalized for its retail release. The Alienware Steam Machine has a gorgeous interface and powerful specs, but its game selection and extra features fall short. If you love PC gaming, and are specifically a long-time Steam user who loves PC gaming, then you owe it to yourself to give this puppy a go. If you're a gamer who's lukewarm on PC gaming-especially if you don't use Steam-don't do it. PC gaming is great and all, but it's a bit darn nerdy, isn't it? Locked away in a dark corner of the house while all the cool kids are hanging out in the lounge with their PlayStations and Xboxes. A valiant attempt to combine the best of PC and console, but is currently weaker than both.